This gorgeous tee was sent to me from ISWAI, a fashion brand by Caggie Dunlop from Made In Chelsea. This tee is in their limited collection '5Ways' and is one of their first ideas to be sold by ISWAI. Some of the pieces on their website really are beautiful, and this tee, despite being gifted to me, is something i would consider buying. I really like how the crosses are situated on the tee, and i really think in this case, less is more. 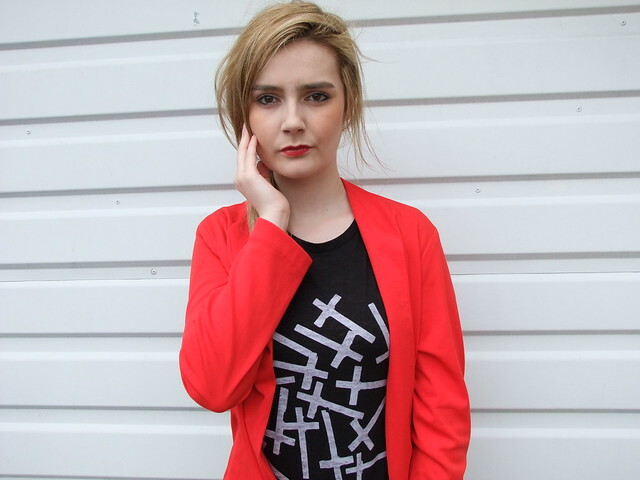 The simple colours of the black all over colour of the tee, and the crosses being a white-grey colour creates a fabulous look. Personally, i decided to make the tee the main look of this outfit, for publicity reasons for the brand, it'd be a shame to hide such a gorgeous top. I've kept it simple by wearing a black tube skirt and a bright red blazer, which draws attention to the top half of the outfit, focusing on the tee. I even got asked about this top when in Sainsburys earlier! Coincidence? I think not. It genuinely is just a gorgeous top which can be worn many ways, whether that be dressed up, or down. I am now following you, please follow me back? like the combo! black and red are my fave! I am still loving how you rock red!